Nick Heidfeld is not the only driver to have been the subject of considerable pressure in the last couple of months or so. Felipe Massa's apparent ascendancy over Kimi Raikkonen has raised questions over Kimi's position in the team and the possibility that he might have to support his team mate's title bid over the last few rounds of the championship. Luca di Montezemolo has been supportive in his comments on Raikkonen but has also muttered about the team's performance as a whole, increasing our suspicion that Ferrari are not happy with the return on their investment in Kimi to date. The Finn remains cool in interviews, insisting that he has no thoughts of retirement, but I think that his driving at Spa was evidence of a man under pressure and feeling it. There was a certain desperation apparent in his driving, first shown in his squeezing of Massa down the Kemmel straight on the opening lap. That was a fairly robust way of preventing a pass and Felipe has expressed his surprise at the move in subsequent interviews. I cannot escape the thought that Kimi was determined not to face the prospect of passing Massa before he could get at Hamilton, having had so much difficulty in overtaking the Brazilian in the past. For most of the race thereafter, he looked in dominant form, easily able to hold Hamilton at bay. It was the change to the harder compound tires and Hamilton's closing on him that began to introduce a certain raggedness to his style again. But he coped, stabilizing the gap at about two seconds, until the rain started. And then it all began to go to pieces. I have seen criticism of Hamilton's actions during the now-famed incident through the Bus Stop chicane and down the following straight, alleging that the McLaren driver should have kept his cool and settled for second place. Apart from the fact that this makes a nonsense of our desire to see more overtaking in F1, it seems to me that it was not Hamilton whose judgement went missing at that moment. At the entrance to the chicane it was Raikkonen who insisted upon his rights as the man with the inside line and Hamilton had the sense to allow him room. And it was Kimi who cut through to the inside of the second segment of the Bus Stop, thereby presenting Lewis with no option but to shortcut the corner. Hard of the Finn but not desperate, we might think. Once past Hamilton on the following straight, Kimi dodged about rather more than necessary to keep the McLaren behind and then swooped over to the left of the circuit to grab the wide line through the La Source hairpin. It looked wrong at the time and still seems inexplicable that he would open so wide a door for Lewis to claim the inside of the corner. What on earth was Kimi thinking? We will probably never know the exact thoughts that went through Kimi's mind at that moment but I suspect that he tried a rather desperate ploy. In the past, Hamilton has been known to con Massa into attempting a pass on the inside that ends with the Brazilian in the dirt; is it possible that Raikkonen was trying to sucker Lewis into over-extending himself in a wild lunge for the corner and a subsequent spin? That was how Raikkonen gained the lead on the second lap, after all, and Kimi may have hoped for a repeat performance from his rival. Whatever the reason, it was a move that gave Hamilton the lead without a fight. Using the McLaren's better grip in the wet, he was able to outbrake the Ferrari and claim the corner. And we all saw how Kimi tried everything he knew thereafter to regain his place. That ended, unsurprisingly, in disaster. But where are the cries that he should have settled for second place, that he would at least have gained points on his team mate had he taken a cooler approach? I hear none and must presume that different yardsticks are being used in our assessment of Kimi and Lewis. There is a lot of speculation in this post, I know, and I offer it only as food for thought. But I think we can say that we saw a Kimi last Sunday who was desperate to prove himself at all costs. It is only a pity that the price proved so expensive in the end. of course there are different yardsticks being used - Hamilton is leading the title race, Kimi is about to lose his. The suggestions that Hamilton settle for second only applied to that brief portion of the race while he still had an ill-gotten advantage. I don't think many people think he should have held station behind a car/driver combo he was much quicker than once he had given back the advantage he had taken. Good point, Don - it is certainly true that Kimi had to go for the points to have a reasonable chance of maintaining his championship challenge. But it is also true that he would have been better advised, once Hamilton was through and into the lead, to settle for second place. Eight points are always better than none. i had wondered about the last couple of minutes before he crashed, too but finally decided to write it off to worsening track conditions and the better stability of hamilton's car- don't forget he had some moments that could have ended badly, too but he looked in much better shape. 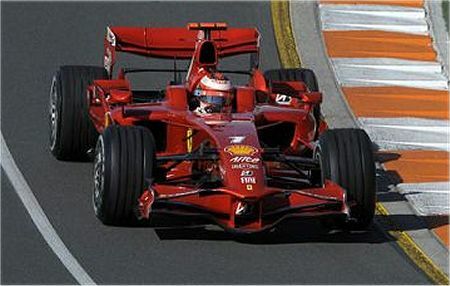 what i thought really put paid to kimi was crossing back on the track on that wide paint strip. wouldn't that be pretty much the equivalent of black ice in the wet? still, he had it on the ragged edge, no doubts. and as far as that jerk to his left? did he over-anticipate hamilton coming up that side or did was he just trying to figure out where hamilton was? i sort of figured kimi had had it after his spin and run onto the grass, though. hamilton definitely had the upper hand before kimi went off onto the runoff before the crash. not the portrait of a driver who lost his cool, exactly. and i still just don't get why anyone would think instead of seizing the opportunity in hand you'd wait to see if you got another a few corners down the road. it's racing, not the drive to work. Kimi's move to the left at La Source is fine if one is intending to go through an uncontested corner - it gives him the flattest line from turning in to acceleration point and so is the quickest way through. With another car somewhere behind you, it is just offering an opportunity for the other driver to stick his car on to your intended line and so force the pass. Cover the inside line is the order of the day (just as Kimi had done in the second section of the Bus Stop) and let your competitor try to drive around you if he has the speed and guts to do it. I think that Kimi tryed to get the less wet part of La Source to try to outbreak Lewis, and hoping that in the middle of the corner Lewis would loose traction because of braking in the wet. Another theory would be that he believed that Lewis would not try to pass him before La Source because of cutting Bus Stop. Why Kimi didn't settle for 2nd place? Well, besides desperately needing to grab as many points as he could, besides watching the race slipping through your fingers, it is really difficult to settle down when the guy in front of you can't barely stay on track - even if Kimi himself couldn't either. Remeber that after the Bus Stop - La Source incident, both Lewis and Kimi went off the track or spun at least three times before Kimi finally crashed into the wall. Of course 8 points would be better than nothing, but this is true to both of them, as they were really struggling to keep their cars on track. Felipe: I agree that your first theory is the most likely reason behind Kimi's move to the left at La Source - but that is pretty much the same as my proposed theory. The second I find harder to believe as it requires Kimi putting more faith in the stewards than I can believe possible. They are both racers and have the instinct to win at all costs. That, too, is the reason for their behavior after Hamilton had got past at La Source - they were racing and on the ragged edge as a result. I doubt that either of them were totting up potential points as they pushed their cars to the limit of adhesion and beyond on that slippery track. My point is that, if we are to criticize Lewis for taking chances rather than driving with the championship in mind, we should do the same for Kimi. I have an idea of why Kimi tried so hard to win, taking so much risk he finally crashed. I believe that being passed by Lewis he thought he was going to be told to let pass Massa too. Team orders coming into his mind??? I do not think this kind of driving is a product of anything else than desperation and Kimi feeling that his car could not cope with the McLaren having the better grip in the wet. He wanted to much from a package that had performed without any errors during the whole race. When the rain started to fall, and he saw Hamilton keep his pace while Kimi had to slow down he simply became frustrated. And i do not remember from where, but i read somewhere htat Kimi had said his reasoning was "all or nothing". Is that really the way to reason if you want to stay World Champion? To be fair to Kimi, Björn, all or nothing had to be his motto at Spa for the simple reason that, if he didn't score any points, he could more or less kiss goodbye to any chance of being champion this year. But, having said that, he should perhaps have been a little more circumspect once Hamilton had got by. Kimi knew that the Ferrari could not keep up with the McLaren in the wet and it was risky to try, therefore.